Thailand seems to be the flavour of the New Year with another incentive for our agents. You could win a trip to Thailand (including an air ticket!) and all you have to do is book your clients to this fabulous destination, get your name in the draw and then you could be experiencing the wonderment of the worlds largest land mammal. What: Book your clients to Thailand and the booking must include a 2 or 3 night stay at the Elephant Hills Safari Camp. Your name will then go into a draw to win an air ticket PLUS 2 or 3 night stay at Elephant Hills (your choice!). You must be a travel agent to receive incentive. One ballot per booking. When: Bookings made and deposited between 01 Jan – March 31 2019. Prize includes: ONE roundtrip economy class ticket, round trip transfers from pick up points, 2 or 3 nights accommodation at the Elephant Hills camp/s, all meals, and all activities as per chosen itinerary. 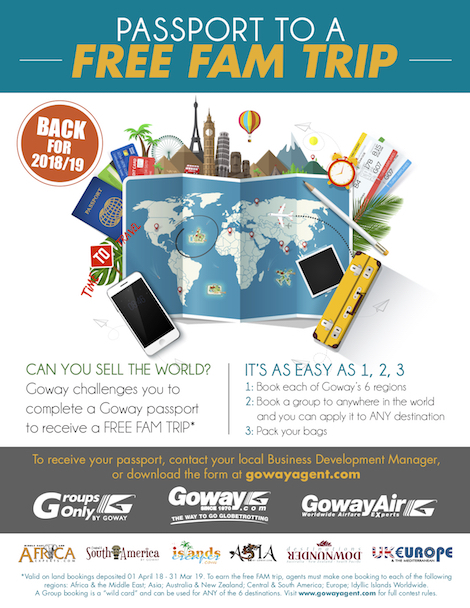 Double your Goway Rewards and Win Aussie Treats! This is for all new bookings from 26 Jan – 31 Mar ’19. There is no place in the world like Australia, and travelling by rail offers a unique and memorable way to explore its length and breadth. Showcasing the diverse landscapes, sights, flavours, wildlife, climates and human endeavour that define Australia, these journeys offer exceptional scale, range and significance. 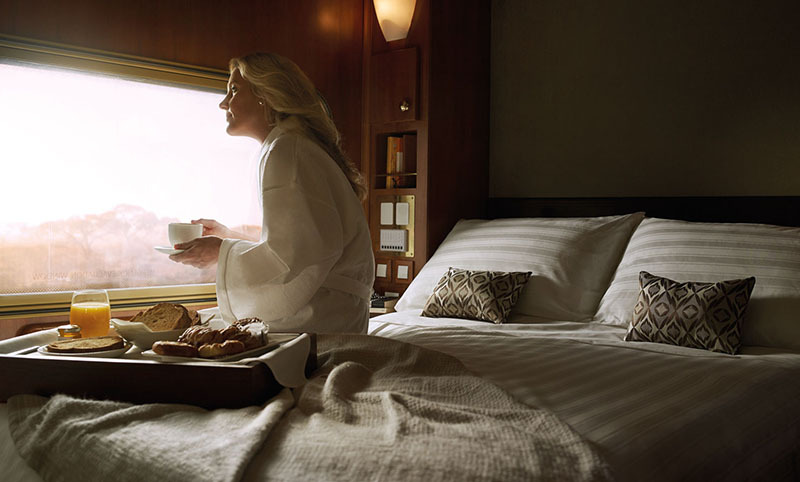 What: Qualifying agents receive $50 per person booked on the Ghan Train, the Indian Pacific Train or the Great Southern Train. You must be a travel agent to receive incentive. One incentive per booking. When: For new travel booked and deposited between January 1 – July 30, 2019. Travel must be completed by 31 March 2020. Book your clients on any Goway New Zealand vacation including round trip airfares with Air New Zealand and at least 5 nights land arrangements and earn double Goway Agent Rewards – $30 per person booked. Incentive will be paid on to your Goway Rewards Card, valid for bookings made until 22 Mar ’19. Incentive can not be combined with any other Reward Incentive. Relax, Rejuvenate and Refresh…Thailand Unplugged. If you are clients are looking to get away from the winter cold and also get back their ‘zen’, why not book a trip to Thailand for them!? You will benefit from it too, by earning $50 Spa Wellness voucher for every booking. The bookings must consist of 7 or more nights in Thailand, booked between 01 Jan and 31 Mar 2019 and for travel until the end of Oct 2019. Good Luck! When selling South Africa, don’t overlook KwaZulu-Natal, the eastern coastal province known as the “Garden Province.” Not only does it have magnificent national parks for game drives, but it is home to the Indian-influenced wonders of Durban and the villages of the Zulu people. In many ways, it is South Africa’s best-kept secret. So let’s get you up to speed on its details so you can sell it to your clients on their next African vacation. Make a booking for an APT Escorted Vacation and qualify for a space on this great New Zealand Fam Trip. Cost is CA$1249 or US$999. Includes: Airfare from Los Angeles, San Francisco or Houston with Air New Zealand, taxes, 9 day tour with APT. 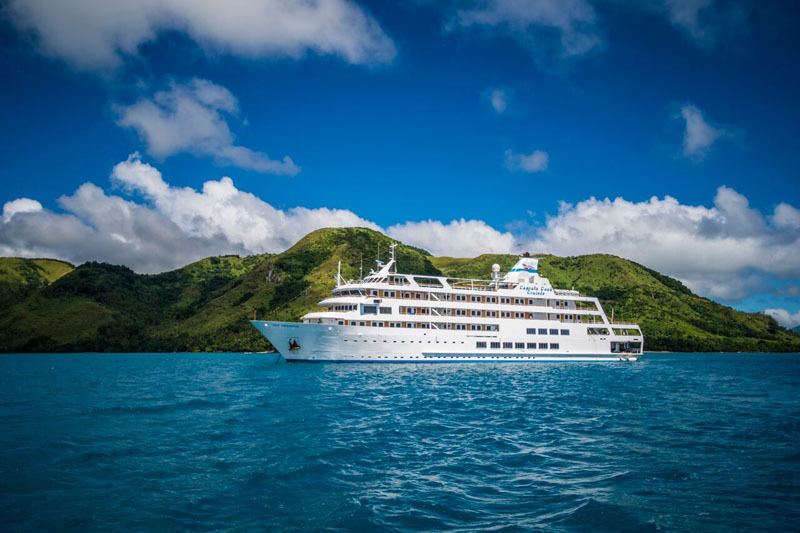 Booked your clients on the beautiful Captain Cook Cruise in Fiji with Goway and earn free nights for your own vacation! • Book a 7 or 11 night cruise and receive 2 free nights aboard. Additional nights at a special discounted rates! • Passengers must travel prior to 31st March 2019. • Qualified bookings must be deposited. • Applies to travel agents who are currently selling Fiji plus one travel companion at discounted rate per night. • Agents booking valid for travel to 31 March 2020. • Additional nights at a special rate of $160 per person per night. *Limited on some promotions. Maximum 8 free nights per agent. 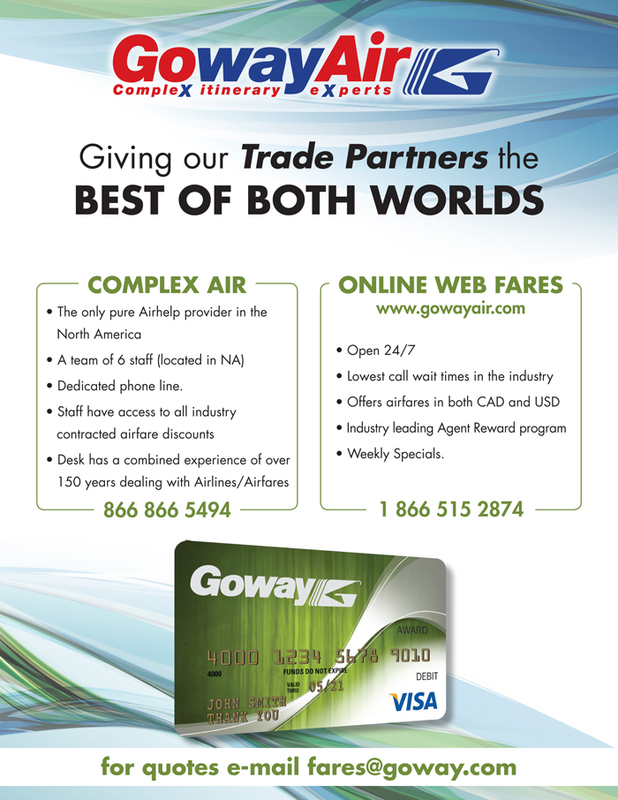 Goway is one of the oldest, largest and most experienced travel companies in North America. We serve world travelers (we call them Globetrotters), providing unforgettable vacations to 100 plus destinations in the UK-Europe, Downunder, Africa, Asia, Central and South America, and the World’s Most Idyllic Islands. Our diversity (air, land, tours, and groups) and specialization ensures unrivalled expertise. 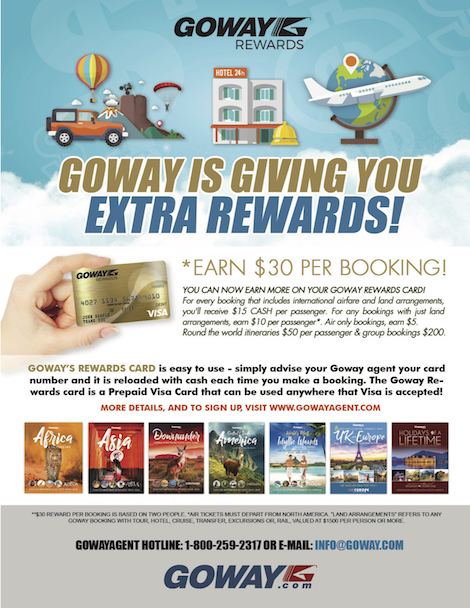 Visit www.gowayagent.com to register for your Goway Agent Rewards Card today!